John Brophy’s recent body of work “Breaking the Spell” explores spiritual themes but through a digital lens. 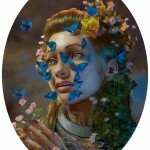 His oil paintings are rendered in a vividly three-dimensional style that makes them akin to digital renderings. The glowing, hologram-like characters interact with ancient goddess symbols and elements of pagan ritual. 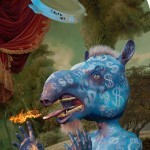 John Brophy’s commentary on consumer culture becomes apparent when logos and dollar signs appear on the characters’ skin. The series was on display at Seattle’s Roq La Rue gallery from December 5th through January 4th 2014.